John Reasoner, who numbered among the early settlers of Jack County, lived on Keechi about ten or twelve miles north of the present town of Graford. During 1860, he and his son were in the field, near their log cabin, shocking wheat. The horses were also in the field, and suddenly became frightened. When Mr. Reasoner raised up to see what was causing the disturbance, he saw a large band of Indians. This early settler and his son, both of whom were unarmed, ran for the house. The son successfully escaped. But Mr. Reasoner in the presence of his family, was lanced and killed near the field fence. Ref: Mrs. Huldy Reasoner, A.M. Lasater, B.L. Ham, James Wood, Joe Fowler, Mrs. Ed. Wohlfforth, Mrs. Huse Bevers, and Mrs. H.G. Taylor, and others, living in Jack and adjoining counties at the time. 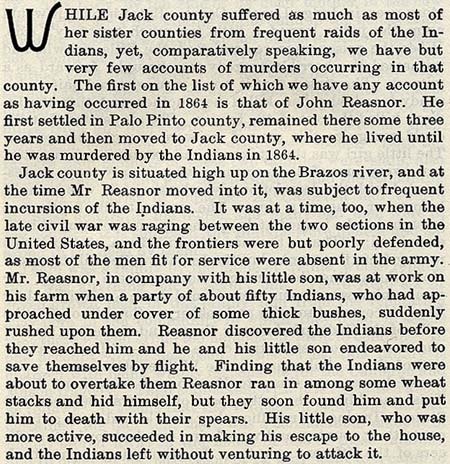 The above story is from the book, Indian Depredations in Texas, by J.W. Wilbarger.